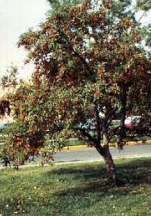 Crabapples and apple vary widely in their resistance to scab. 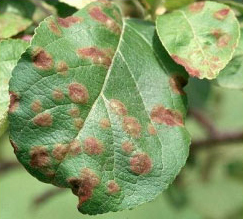 Related (but different) species of the fungus that cause apple scab produce scab on hawthorn, mountain ash and pyracantha. Apple scab describes the disease as it appears on the disfigured host fruit. Apple Scab also causes premature leaf drop reducing tree vigor. Early leaf drop also forces the host tree to draw on stored energy reserves to produce a second leaf flush for the season. 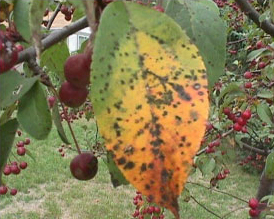 Scab infection causes purplish blotches on leaves and lesions on fruit. Symptoms appear as velvety olive green spots on leaves varying in size from a pinhead to ½ inch. As lesions enlarge, they run together and form larger areas. Leaves turn yellow and drop off in mid summer. Severely affected trees can be nearly defoliated by September. Fruits may also develop rough, corky, brown spots. The fungus produces two types of spores. Sexual spores are produced on fallen leaves infected the previous year, to infect new leaves by wind and splashing rain. Subsequent infections spread on the tree through asexual spores (called conidia) via wind and rain splash. The disease is more severe in years with wet spring weather. Fungicides applied at first leaf bud flush repeated at 7-10 day intervals from May through June.